If you're looking for a little TV snack, why not try one of these lovely, melt in the mouth crackers? I found this recipe in one of my US bakery cook books (can you tell I'm on an American kick at the moment? ), the utterly delightful Back in the Day Bakery Cookbook. Cheryl and Griffith Day run a neighbourhood bakery, the Back in the Day Bakery, in Savannah, Georgia. Their book, comprising over 100 of their recipes, is definitely one of my favourite baking books. The recipes are mouth watering, and the book is beautifully laid out and photographed. 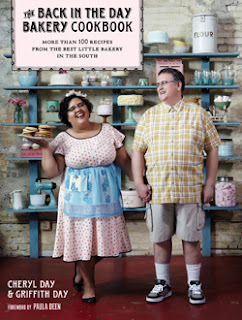 The pastel colours used reflect the faded, vintage Southern charm of the bakery. I love it. If you're like me, and love American baking, towering layer cakes, milk glass cake stands, stripy straws, etc you would too. There are so many recipes I want to try from this book: Cinnamon Sugar Doughnut Muffins, Pecan Chocolate Espresso Coffee Cake, Blueberry Buckle, Chocolate Bread, Brown Sugar Bundt Cake, Lemon Pie Bars, Bacon Jam - the list goes on and on. Today, I wanted something quick and easy to try. So I settled on these Pecorino and Rosemary Crackers. They were perfect. I've translated the recipe from the US measurements given in the book. Preheat the oven to 160 fan / 180 conventional / 350F / Gas 4. Line a baking tray with parchment. Place the butter in a stand mixer with the paddle attached. Cream until smooth - about 1 minute. Add the cheese, rosemary, salt and pepper, and mix in. On low, add the flour, and mix until the dough comes together in clumps. Turn out onto a lightly floured surface and bring together. Form into a log shape, and wrapped in clingfilm, refrigerate for at least 1 hour (at this point the dough will keep for up to 3 days). When ready to bake, remove the cling film and slice into rounds about 3mm thick. Place on the baking tray and allow a little space for spreading. Bake for 18 - 20 minutes until lightly brown on the edges. Cool completely. Apparently, these will keep in an airtight container for up to a week. Or, you can freeze the dough for up to 3 months. Just defrost in the fridge overnight, and then slice and bake as normal. I wouldn't know though. I made up a batch of eight and having sampled one fresh from the oven (which was lovely: buttery,cheesy and aromatic from the rosemary and pepper), left them to cool while I took Josh and Ben to see the Avengers and leaving Mike in charge of Sam and the house. When we got back, there was no sign of them. Not a one. Just a mildly guilty looking husband who innocently asked 'What crackers ...?'. Guess they were pretty good.